By 1949 the Cold War between the U.S. and the Soviet Union got even colder with the establishment of the German Democratic Republic under Soviet Rule. Communism had been declared in China by Chairman Mao only a week earlier. It didn’t help matters that the first successful atomic test by the Soviets had just taken place in July. The “good” news of 1949 included the invention of the bikini and the discovery of cortisone for the treatment of arthritis. But in 1949 America, the post-war baby boom was well underway. Former GIs were attending college, and the American suburb was starting its ascendancy toward the iconic mid-20th century American institution. The Indian Chief, which had been a standard police motorcycle for many years was essentially gone from the scene, however. No Chiefs from the year 1949 are known to exist. Instead, new models like the 149 Arrow and the Super Scout 249 were introduced that year. Unfortunately, these products were not developed well enough for their quality to live up to the Indian reputation. Indian’s Dyna-Torque vertical twin engines were launched in 1949 to rescue the company. BSAs and Triumphs imported from Britain were becoming popular, however. 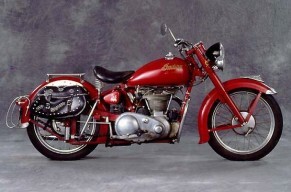 The 440 cc Scout and the single-cylinder 220 cc Arrow were Indian’s answer to the new competition. Though there was much marketing hype leading up to the launch of these two models, the reception was tepid at best. Sadly, the bikes that managed to sell were found to be unreliable. The company was struggling in 1949, and because the British pound had been devalued against the dollar, the imports were cheaper than ever. By this time another British company, Brockhouse Ltd. had been financing Indian, and a year later Brockhouse bought it outright. But the failure of the V-twin was impossible to recover from, and Indian was split in half: one half for manufacturing and the other half for sales. The year 1949 was a shaky one for America as a whole. Economic inflation coupled with the devaluation of the British pound made cheap British imports impossible to resist, and that further complicated the problems the Indian Motorcycle Company was experiencing. There was sadness, but not much surprise when the company shut four years later.